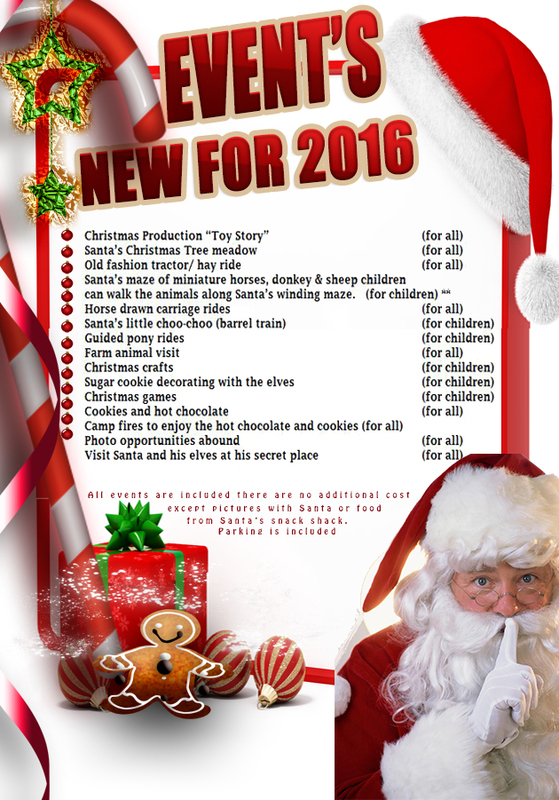 Santas Secret Adventure Treat your child to an experience they will remember for a life time only at Penryn Oak Stables Penryn California. CLICK ABOVE PICTURE TO BE DIRECTED TO SITE. Santa’s Secret Adventure only at Penryn Oak Stables Penryn California, Treat your child to an experience they will remember for a life time only at Penryn Oak Stables Penryn California. Don’t miss this incredible adventure that captures the true essence of the holiday season! A memorable adventure to be had by all that gives you an up close and personal experience with Santa, Mrs. Claus and his fantastic helpers, the elves! **You and your children will be whisked away by one of Santa’s own horse drawn carriages being pulled by either Snowflake or Snowball. Two beautiful draft horses. Making your way through the trails and trees to Santa’s secret place you’ll want to bundle up as the cool air and the holiday spirit surround you. **Seated next to the warmth of a Christmas fire you’ll get to listen to some of the adventurous stories told by Santa’s own elves. They’ve even been known to break into song singing some of the all time favorite Christmas carols. During this exciting time you’ll get to enjoy Santa’s favorite, a chocolate chip cookie, and hot chocolate. **A site to behold you will then get to visit Santa and head elf in Santa’s secret place. This is a very special magical place that gives you a glimpse of how the Claus’ live. **Your children if they so choose may ride on one of Santa’s own holiday decorated ponies, Jingle, Jangle or Ellie. Santa’s magical adventure will put you, your family and friends in the true Holiday spirit and provide each and everyone with a memory to cherish for a lifetime. The adventure begins the weekend after Thanksgiving and continues through to December 23rd. Go To www.santassecretadventure.com For all your reservations and information 916-521-9135 Santa’s Secret adventure is located in Penryn Ca.